CRAZY DISCOUNT! Was: $149.95 Now: $79.98! This Paw Mate cat play tree is the perfect solution to offer your feline a fun way to exercise, rest and scratch their nails! The tree has many different attractions for your cat so it will sure enjoy this amazing cat tree. The tree suits many different breeds so it is very versatile and also made using top quality materials for comfort and safety of your loved pet! 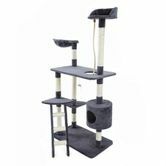 The tree has many different platforms so your cat can climb, jump and rest! If they are feeling lazy and do not want to be disturbed, there are hiding holes so they can have their own space. There also scratching poles on the tree so instead of scratching and damaging your furniture, wall papers or curtains. With so many different attractions in one tree, your cat will be feeling like in a wonderland! The tree is made using top quality materials in order to give the best comfort for your pet. The plush covering on the tree is made of non-toxic high quality cotton flannel to maximize comfort and the perch is made of high quality and middle density panel which has excellent weight capacity and stability which makes it safe for your cat when it jumps and climbs the tree. The tree is also easy to clean so maintenance is very easy. This tree is also great for people who have many cats. If you are looking for a safe and fun way to make your cat exercise, this tree is the perfect solution! The tree is easy to assemble and easy to clean. It is a great way to give your cats a way to unleash their natural instincts.